Run this software and protect yourself. Protect your corporate account against fraud and cyber criminals – they’re out there and trying to get in. Download Trusteer Rapport. Know your account is protected. You Don't Have Enough Online Security. But You Should. Malware and phishing allow cyber criminals to access your computer, corporate account numbers, and business information. It can take days or weeks to be detected but by then, it's too late. Trusteer Rapport Works Hard to Protect You. Works alongside your current security software, increasing your protection and decreasing your susceptibility to criminal behavior, protecting you and your business from threats your antivirus cannot. Trusteer Rapport verifies that you’re connected to your bank's actual website and creates a secure line of communication. Easy to Use. Won’t Slow You Down. Trusteer Rapport takes just minutes to download and install. It runs in the background so your computer tasks continue completely uninterrupted. 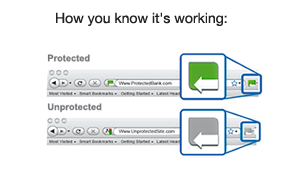 Once installed, a small Trusteer Rapport icon will appear next to your browser’s address bar, changing color to let you know when it's working.